Summer is finally here and with it comes Farmer’s Market Season! With multiple markets in the Twin Cities (here is a list! ), there is plenty of opportunity to buy fresh produce and support local farmers this summer. 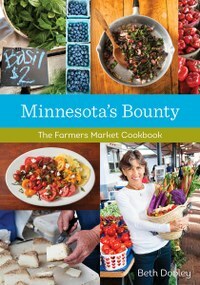 For those excited about shopping at the farmer’s markets in Minnesota, Beth Dooley’s, Minnesota Bounty: The Farmer’s Market Cookbook, is a great cookbook to add to the family collection. Dooley not only provides great recipes that incorporate the local produce, cheeses, meats, and fish found at the Farmer’s Markets, but also gives tips for shopping at the markets. She hopes to engage readers who are concerned that they will buy too much produce, or who feel they need a set list while shopping. Be sure to grab a copy and get inspired!